Author of sensation novels. Mary Braddon was privately educated. Her mother divorced her father in 1840 and when she was ten years old her brother Edward left for India (he would eventually become premier of Tasmania from 1894 to 1899). Mary worked for several years as an actress to support herself and her mother. In 1860 she met the publisher John Maxwell. He was married, but his wife lived in an asylum in Ireland. She lived with Maxwell and his five children from 1861 onwards. After his wife died she married him in 1874. They had six more children together. In 1862 she published her first and most famous novel, "Audley's Secret". It was immediately succesful and numerous novels followed, among them "Aurora Floyd" (1863). In 1866 she started "Belgravia Magazine". She was also the editor of "Temple Bar Magazine". From 1866 onwards she lived with her husband at Lichfield House in Richmond-upon-Thames and she died in Richmond in 1915. There's a plaque for her in Richmond Parish Church. Her last novel "Mary" was published posthumously in 1916. Her husband had died on 5 Mar 1895. 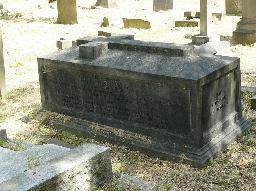 The grave of Mary Elizabeth Braddon at Richmond Cemetery, London.